I was having a mini design block yesterday and asked my facebook readers for their favorite color schemes right now. One response was Peacock…thanks Lindsay! I loved this idea, partly because it could go so many directions. I decided to pull out the jewel tone blues and a few other compliments. I may do another board and pull more of the purples out. When I first saw peacock I thought sophisticated…nothing screaming baby. I think many people are realizing that the nursery is just an extension of their entire homes style. You don’t, necessarily, have to have it pastel and nursery rhymes. That is still a super cute way to go, but isn’t for everyone. So thanks again for helping with the design block. Feel free to share a color scheme or theme you are dying to see…I’m always up for another challenge. Below are the links to the items that are available for purchase that I used on my design board. The fun part about these boards is they are a tool, a direction. 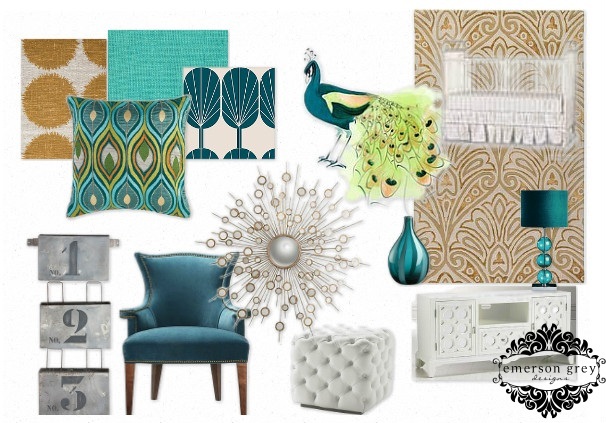 Each item you see in any of my design boards doesn’t have to be the exact one used in a room. Instead, it is a way to show you my vision. Then it’s shopping time! !